Just so I get that cleared up incase youre wondering. Anyways.....ahem. soo..about this wall. Well, first this was supposed to be a totally different wall. It was actually a very very good idea too, but I ended up not being able to do it because Kyo's knee was in the way (lol no no, its nothing bad). Since that whole part was supposed to be the theme, I couldnt do the theme anymore...ahh well. I think Im going to find another picture with a beat up person in it. But kyo was the perfect character to work with on my first idea...ok well Im blabbing here and you guys have no clue what Im talking about. song:: umm everything i have? back to explaining the wall --> I know its very very simple. I didn't want to add anything in the room because it would make it look like it was being lived in. I wanted the room to look isolated, dark, and gloomy. I know, its a depressing wall. Ive never made a depressing wall before. Oh! and there are only 2 sparkle brushes in this too! Im so proud of myself. The butterfly is in the wall because I wanted something beautiful in it. It kind of represents kyo himself. I know a cat would have been better, but it would have been kind of big and it would have taken away from the meaning of the wall. If you look closely, you can tell that one wing of the butterfly came off. the butterfly is slowly floating down and its dying. so it kind of symbolizes a slowly dying kyo from being locked up in the room. ( i know, it doesnt really look like hes locked up because the shoji is open and all, but he is) This is one of those "look closely and you shall see" wallpapers. Look closely and you shall see the dislocated wing. Look closely and you shall see the maple leaf pattern on the shoji screens! lol sorry this is so long. well, please full view and download if you like. o yes. and its drizzling outside. 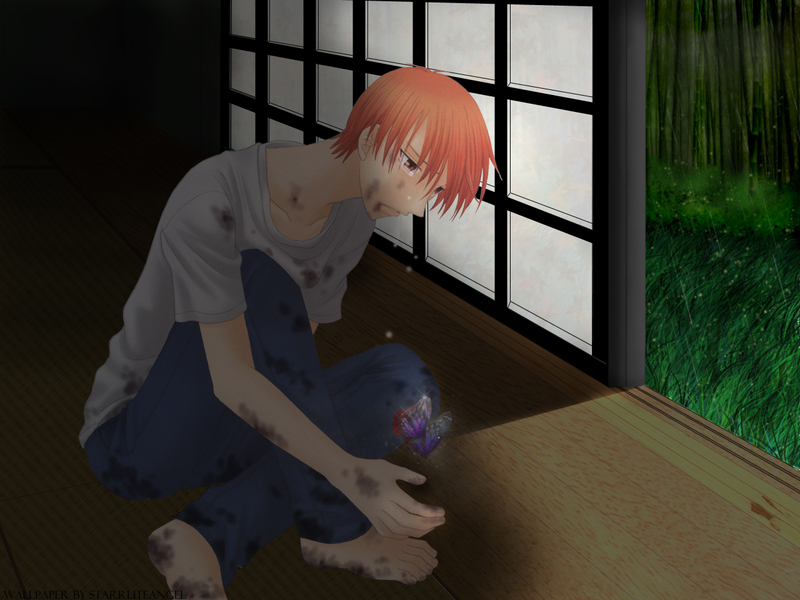 i wanted something else to go along with kyo's tears and this depressing mood.